It's been so cold these past few weeks that I have kept ventures out of my house to a bare minimum, something my lungs are happy about, they really don't like the cold. Probably subconsciously because of the cold, I have been adding to my epic beadspread, I am loving the random, bright colours, it really reminds me of summer, I'm not sure why, but looking at it makes me feel a bit warmer :) It's really coming along now :) it should be finished by next winter! Just a quick post from me this week (I owe a friend a loooong chat tonight!) be sure to check out Handmade Monday by Wendy, Also a massive thank you to diomoglass who nominated me for a Versatile Blogger Award! Yey! I have some rules to follow before I can claim it, hopefully this will be done in the coming week! That is lovely and bright and cheery. Well done on your blogging award. 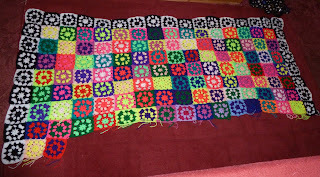 The quilt is looking relay lovely - as you say, it has a summery look to it. Hope you have a good week. The only thing to do is to hunker down and wait for better weather. Stay warm, keep well.Epic beadspread is coming along nicely - I gave up on mine out of sheer boredom! Thats one cosy looking quilt. Must have taken ages to do as much as you have. You'll finish that knowing you've achieved something. Those are the best projects! Oh very pretty! It's so chilly here today it looks so nice and warm! 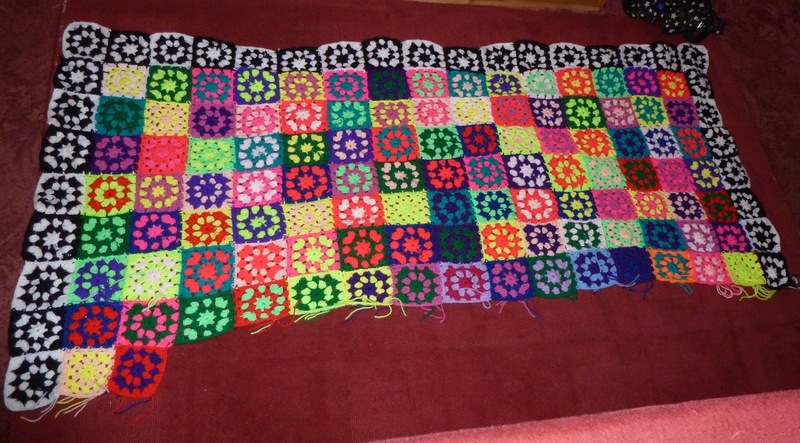 Lovely colours and I love the way you have done the border squares in the black and white. Harriet, that looks just lovely... and it is growing so fast, what I really like is the monochrome border which finishes it to a T.
Since following other folks blogs I seem to have developed a bit of an obsession for crochet Hal kegs. Can't crochet myself, but I do love them - remind me of my childhood! I love that name - the epic bedspread! Looking good!